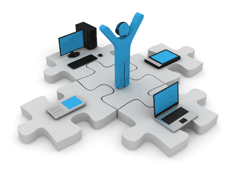 The staff at ACI is experienced in just about every website development technology available. If you have an existing site and need changes from minor tweaks to major redesign, we can help with low hourly rates. In fact, many times, we help in fractions of an hour (and bill you just the fraction, not a whole hour!). Often, our clients just don’t have the time to update their photographs and images, or add a quick paragraph about a new product or service. ACI can make these changes for you in your existing website. For our local customers (New River Valley, Roanoke Valley, and the surrounding area), we offer small to medium business IT support, providing on-site assistance with your network, servers, workstations, mobile technology, office software, and multimedia equipment. With hourly rates much lower than big-box geeks for hire, we offer a consistent, faster solution to get you up and running quickly. We can update your website content including, but not limited to, text, images, events, articles, videos, and other items at your request. In addition, we can create a support plan that provides routine or scheduled updates.